I used to have an artist-girlfriend, an ardent feminist, who did not suffer fools gladly. That's why it's a used-to-be situation; I was the fool, obviously. Yet even as she found me repulsive, she was fascinated the "Beats" - Jack Keroac, William S. Burroughs, Allen Ginsberg, Laurence Ferlinghetti, all those drunken-stoned-"Howling" poets who ushered in the counterculture, plus occasionally beat their women (hey, is that why they were called the Beats?) and shot their wives. These men, I guess, were her heroes all the same. Ain’t feminists wacky? Just about the only time she'd even let me in the door was when I had an advance review copy of the Beat Generation documentary THE SOURCE to give her. And I even possessed the coincident surname as one of the Beats, Neal Cassady. No other similarity or appeal, evidently. In short, unlike her, I never quite got the brouhaha about the Beats. And I still don't quite get it - but I can salute the nostalgia-relic value, I suppose - in MAGIC BUS. It's about the "Merry Pranksters" group of proto-hippies who formed around author Ken Kesey, Cassady and the Grateful Dead in the mid-1960s. 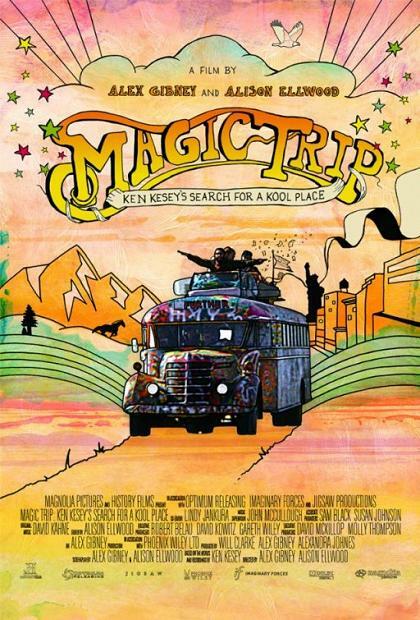 The feature documentary by Alex Gibney and Allison Ellwood was done with the assistance of Kesey's widow and family, and it tells the Merry Pranksters story in their own words/images, in particular the legendary 1964 cross-country road trip undertaken by the Oregon-based Kesey and his LSD-loving co-ed cohorts and girlfriends. Kesey described himself and his cohorts as too young to be Beatniks, too old to be hippies. Nonetheless, in Partridge Family fashion they took to the road in a psychedelic painted bus dubbed `Further.' The driver, at least part of the way, was in fact On the Road inspiration and icon Neal Cassady, and the ostensible goals were in fact to sort of re-enact On the Road, going to visit the World's Fair in New York and meet Keroac, Timothy Leary, and the East Coast scenesters. But Kesey, cruising on the success of two novels, One Flew Over the Cuckoo's Nest and Sometimes a Great Notion, had another aim: film the odyssey as it transpired, on high-end 16mm and audio-recording equipment (never mind that few of the group knew exactly how to operate the gear, stoned or sober). That material is presented here, with sound clips from the survivors and some re-enacted material (featuring Stanley Tucci). Some of the Pranksters - especially the women - dropped out part of the way through the journey, never quite recovering from extreme acid trips or impromptu love affairs. Neal Cassady himself, an ever-shirtless, amphetamine-stoked guy who seems to chatter like a top-40 radio DJ (this is why I can't get hired, I think; local employers Google my name and end up with him. Hey, Cleveland HR, I'm the Cassady who doesn't have the Wikipedia entry, but I'm the one who's still alive and does sometimes wear a shirt, assuming that jibes with your corporate values). Neal Cassady got as far as NYC but didn't do the return trip. The World's Fair is described as a corporate-consumerist-kitsch disappointment, Kerouac was a burnt-out grouch, and Timothy Leary and the Beats largely snubbed the visitors. But it's okay because the journey became more of the point, with important bases touched by Further in San Francisco, Los Angeles, Texas and New Orleans. It appears the route back west might have gone through Cleveland - either that or the Pranksters took a detour through Canada to avoid this uncool place; somebody fact-check me about that. The bus trip is enshrined as the true dawn of the 1960s era of hippie "happenings." It endured in memory because of the hours of freeform celluloid became a centerpiece Kesey's later Saturday-night screening parties, with the Grateful Dead as musical entertainment and LSD-infused Kool-Aid as libations. Nonetheless, MAGIC TRIP wants us to remember Ken Kesey not just as a hallucinogen enthusiast but also a grounded family man (though not terribly faithful in his wife's absence; guy was a Beat, after all) who ultimately made the decision that the counterculture was getting too extreme, and that he'd reach a stable plateau in which no more acid-dropping was necessary (this declaration came after a high-profile dope arrest, making me wonder if this wasn't just PR). Kesey is contrasted with rootless speed-freak Cassady, who never completed any literary or dramatic work outside of being his own crazy self, had less-than-ideal bisexual relationships and would die in sordid circumstances.